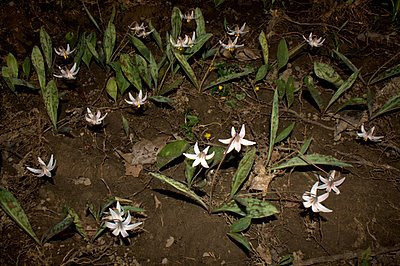 This plant has quite a few names, but the safest thing to call it is Erythronium albidum, and I usually go with the name white trout-lily. The population along the Olentangy is doing fantastic this year. In fact, the wildlflower display is much more abundant that one year ago, when we had a very early spring warmup following by a killing frost that wiped out many flowers for the year. Our wait for spring has been arduous, but now that spring has literally sprung, the wait was certainly worth it! I'd be curious to hear any other names that this species is given. I remember my high school biology teacher joking around saying this is the plant that caused scientists to use standardized latin names- to simply avoid confusion with so many common names. 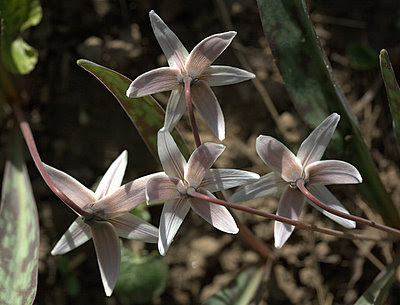 The coloration in this plant is a pale white almost fading to lilac. It is certainly beautiful. Next post- the yellow trout lily. Another beautiful wildflower! You are really giving us an excellent display...can't wait for the yellow one. Tom, this is such a wonderful flower and a friend of mine just posted a few pictures of these lily's that are growing in his yard! 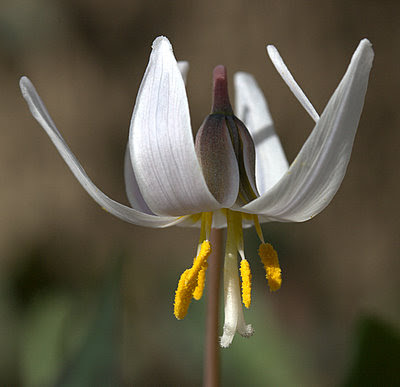 I am now looking at all Trout Lily's that I find in hopes of finding these white ones! I came across one patch of these white trout lilies last year and was so surprised to see them. Thanks for the info on it. Very lovely shots. We have these in a nature trail in our city. I will have to get over there soon to see if they are open. I missed them last year. I realize now they open a bit earlier in the season. Tom: Thanks for the lesson on one I didn't know. That Trout Lily is a pretty little bloom. Great photos, Tom. I've always heard them called trout lilies and wasn't aware of the other names. Lovely photos of a lovely flower! 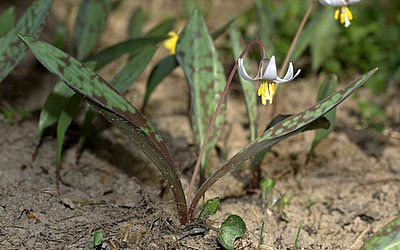 Another good reason to use scientific names - we have a totally different flower here that's commonly called Fetid Adder's Tongue (see http://adampaul.com/gallery/Wildflowers/Lily/Fetid%20Adders%20Tongue/index.html if you're curious what it looks like - the leaves are quite similar to Trout Lilies, but that's about where the similarity ends!). Tom- cool- be sure to check out sandy areas along streams. Ruth- you are welcome, you just have to hit the right habitat to see these plants, I guess. Thanks Beth Ellen- Yes, would love to see wildflower images from your neck of the woods. Wren- Yep, the trout lily comes from the mottled leaf. Adam- I will take a look. I love seeing the things that you guys have in Cali. The third trout lily I've seen this week. All were different, but all were beautiful. I'm loving it.